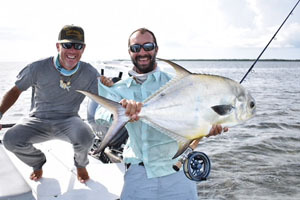 IGFA Representative Nathaniel Linville potentially set the new men’s 1 kg (2 lb) tippet class world record for permit (Trachinotus falcatus) with this 7.25-kilogram (16-pound) fish he caught and released on August 29, 2018, while fishing off Key West with local guide John O’Hearn. The current world record of 4.42 kilograms (9 pounds, 12 ounces) was set more than 30 years ago by renowned fly angler Del Brown while fishing with IGFA Fishing Hall of Fame Member Capt. Steve Huff. Lydia Murray – age 15 - caught and released this beautiful brook trout (Salvelinus fontinalis) on July 13, 2018 while fishing the Atikonak River in Labrador, Canada. 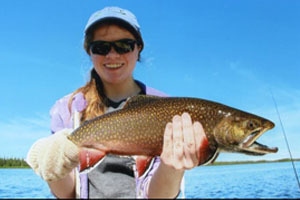 If approved, Murray's 1.81-kilogram (4-pound) brook trout would become the new Female Junior world record, which currently stands at 0.73 kilograms (1-pound, 10-ounces). Japanese angler Yukiyo Okuyama caught and released this 6.9-kilogram (15-pound, 14-ounce) common carp (Cyprinus carpio) on July 30, 2018 while fly fishing Japan’s Lake Shoji. 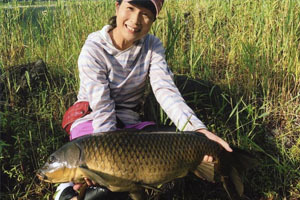 Using ultra-light class tippet and a custom bread-patterned fly, Okuyama successfully landed the carp after a 25 minute fight. Once landed, the fish was quickly documented, weighed and released alive. If approved, the catch will qualify Okuyama for the new women’s 1 kg (2 lb) tippet class world record, which currently stands at 3.4-kilograms (7-pounds, 8-ounces). South African angler Jonathan Booysen caught this potential world record meagre (Argyrosomus spp.) on August 14, 2018 while fishing off Richards Bay, South Africa. Booysen needed 15 minutes to land the 36.7-kilogram (80-pound, 14-ounce) fish after it ate the live bait he was fishing on the bottom. 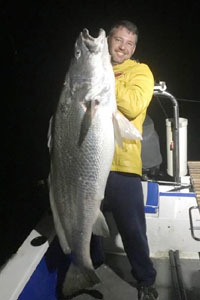 If approved, the catch will become the new men's 10 kg (20 lb) line class world record, which currently stands at 22.6 kilograms (49 pounds, 13 ounces). 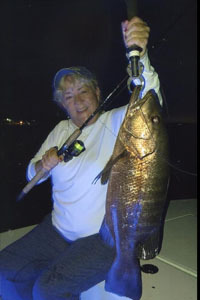 Pamela Marmin potentially set the new women’s 3 kg (6 lb) line class world record for cubera snapper (Lutjanus cyanopterus) with this 4.42-kilogram (9-pound, 12-ounce) fish that she caught on August 25, 2018 while fishing out of Stuart, Florida. Marmin needed only ten minutes to land the hard-fighting snapper after it ate the dead mullet she was using for bait. If approved, the catch will replace the current world which stands at 1.4 kilograms (3 pounds, 1 ounce).